I read somewhere that Maine has more lighthouses than anywhere else in the United States. Have no idea as to whether that is true or not, but, I do know that you will find many, many lighthouses up and down the Maine coastline. Many of them are small ones like this one. Notice the size of the door in comparison with the size of the lighthouse. In this photo, I like how the three rock outcrops mirrored each other and formed a nice repetitive lines to lead the eye to the lighthouse. To lesser degree, I think the bank on the far side also helps carryout this idea. Camera settings: Nikon D4, 28-300mm f/3.5~5.6 with polarizing filter attached at 56mm, ISO 100, f/16 at 1/125th of a seconds on a tripod. Lightroom 4—applied Landscape preset during import, set white and black points, increased contrast and tweaked the blues and aquas saturation and luminance. The colors are wonderful. The simple design composition just adds to the overall effectiveness of the photo. 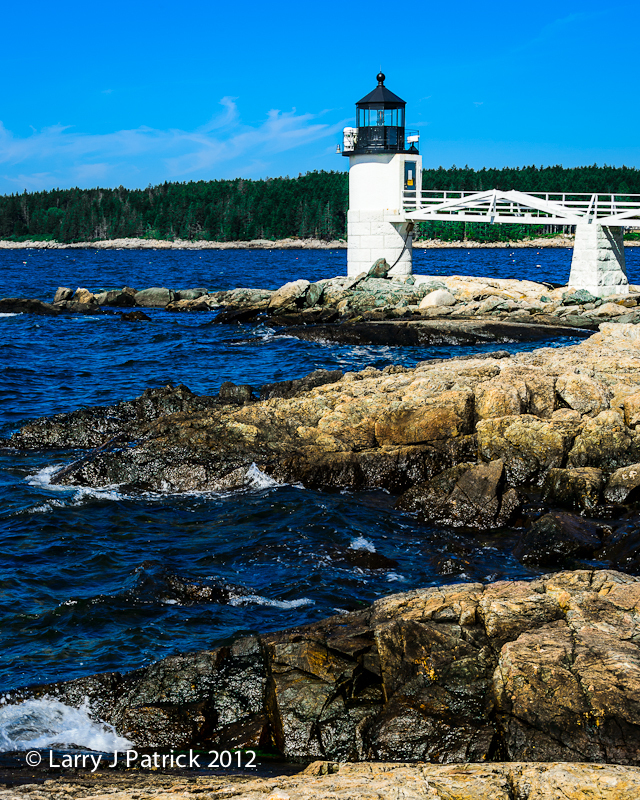 You captured an outstanding vision of Maine.